Have you ever looked at a “Blueprint” and wondered what all of the information meant? 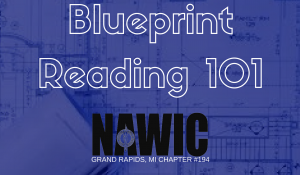 Erin Caszatt, a Structural Steel Detailer at Soils and Structures, will guide us through the basics of Blueprint reading. Erin has 15 years of experience in using Structural and Architectural Design Drawings, aka “Blueprints” to create Fabrication Drawings for Structural Steel Fabricators. Blueprints can appear to be confusing and overwhelming if you don’t know what information they are trying to show. There are different types of drawings that show information based on what trade the drawing is intended for and who is responsible for the design. Erin will break down the design drawings into easier to understand pieces. Hopefully, the next time you see a “Blueprint” it won’t leave you scratching your head. We will have networking and dinner from 5:30pm to 6:00 pm. Please note, that this is a catered dinner based on the number of reservations received. If you need to cancel your RSVP, please do so before May 1st or you will be charged for dinner.